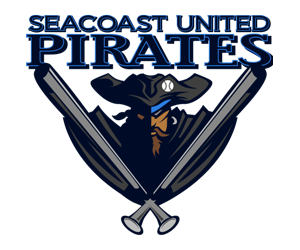 Seacoast United Pirates Baseball Club will compete in the New England Elite Baseball League for the spring 2017 season. Home fields are centralized in the seacoast region of New Hampshire, with regional games taking place throughout Southern NH and the north shore of Massachusetts. The Seacoast United Pirates field teams from 9U through 18U age groups, placed in competitive divisions appropriate for their level of play. Below is an outline of the club season broken down by age group. 13U and 14U groups begin their season with weekend club trainings throughout November and December. Club trainings are not mandatory, but players in attendance will have a better understanding of the program philosophy and coaching staff. Beginning in January, club teams will begin practicing as a collective group once a week. In addition to team practices, specialized skills clinics are also available to club players interested in additional training. Starting the first weekend of April, club teams will compete in the New England Elite Baseball League. Teams will play one double header on Saturday and/or Sunday, with two in-season travel tournaments. 15U, 16U, 17U and 18U groups begin their season with weekend club trainings throughout November and December. Club trainings are not mandatory, but players in attendance will have a better understanding of the program philosophy and coaching staff. Beginning in January, club teams will begin practicing as a collective group once a week. In addition to team practices, specialized skills clinics are also available to club players interested in additional training. Team practices will conclude at the end of March or the beginning of the high school baseball season. Starting the second weekend of June, club teams will compete in the New England Elite Baseball League. Teams will play one double header on Saturday and/or Sunday, with three in-season travel tournaments. 16U Prospect, 16U Showcase, and 17U Showcase begin their season with weekend club trainings throughout November and December. Club trainings are not mandatory, but players in attendance will have a better understanding of the program philosophy and coaching staff. Beginning in January, club teams will begin practicing as a collective group once a week. In addition to team practices, specialized skills clinics are also available to club players interested in additional training. Team practices will conclude at the end of March or the beginning of the high school baseball season. Starting the second weekend of June, club teams will begin a comprehensive tournament schedule that will include six, high caliber travel tournaments, including a team trip to East Cobb, Georgia, that will give players an opportunity to showcase their abilities in front of college coaches. Past regional events include: Perfect Game Super 25 Regional Qualifier, Northeast Selects Prospect Tournament, Super East College Showcase Invitational, Diamond Nation.